Crown Respirotone has special herbal medicines for prophylaxis and treatment against respiratory diseases in birds and animals. It has medicines having wide spectrum action against bacteria, virus, fungus and non-specific agents causing respiratory diseases. 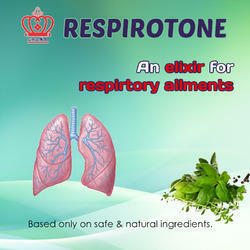 It relieves respiratory distresses like respiratory rales, mucus by its decongestion, mycolytic and expectorant effects. INDICATIONS : Coryza, IB CRD, RD and other respiratory diseases associated with different etiological agents. INGREDIENTS : It includes ADATHODA VESICA, OCIMUM SANTCUM. LIQUID CONCENTRATE : Has similar beneficial effects as that Crown Respirofit – powder. Looking for Respiration Aiding Feed Supplement ?